"The IRA" redirects here. For other uses, see IRA (disambiguation) and Irish Republican Army (disambiguation). Flying Column No. 2 of the 3rd Tipperary Brigade of the Old IRA, photographed during the early 1920s. All organisations calling themselves "Irish Republic Army" claim legitimate descent (sometimes compared to apostolic succession) from this IRA of 1919–22. The Irish Republican Army (IRA) are paramilitary movements in Ireland in the 20th and the 21st century dedicated to Irish republicanism, the belief that all of Ireland should be an independent republic from British rule and free to form their own government. The original Irish Republican Army formed in 1917 from those Irish Volunteers who did not enlist in the British Army during World War I, members of the Irish Citizen Army and others. Irishmen formerly in the British Army returned to Ireland and fought in the Irish War of Independence. During the Irish War of Independence it was the army of the Irish Republic, declared by Dáil Éireann in 1919. Some Irish people dispute the claims of more recently created organisations that insist that they are the only legitimate descendants of the original IRA, often referred to as the "Old IRA". The playwright and former IRA member Brendan Behan once said that the first issue on any Irish organisation's agenda was "the split". For the IRA, that has often been the case. The first split came after the Anglo-Irish Treaty in 1921, with supporters of the Treaty forming the nucleus of the National Army of the newly created Irish Free State, while the anti-treaty forces continued to use the name Irish Republican Army. After the end of the Irish Civil War (1922–23), the IRA was around in one form or another for forty years, when it split into the Official IRA and the Provisional IRA in 1969. The latter then had its own breakaways, namely the Real IRA and the Continuity IRA, each claiming to be the true successor of the Army of the Irish Republic. The Irish Republican Army (1919–1922) (in later years, known as the "Old" IRA), recognised by the First Dáil as the legitimate army of the Irish Republic in April 1921 and fought the Irish War of Independence. On ratification by the Dáil of the Anglo-Irish Treaty, it split into pro-Treaty forces (the National Army, also known as the Government forces or the Regulars) and anti-Treaty forces (the Republicans, Irregulars or Executive forces) after the Treaty. These two went on to fight the Irish Civil War. The Irish Republican Army (1922–1969), the anti-treaty IRA which fought and lost the civil war and which thereafter refused to recognise either the Irish Free State or Northern Ireland, deeming them both to be creations of British imperialism. It existed in one form or another for over 40 years before splitting in 1969. The Official IRA (OIRA), the remainder of the IRA after the 1969 split with the Provisionals; was primarily Marxist in its political orientation. It is now inactive in the military sense, while its political wing, Official Sinn Féin, became the Workers' Party of Ireland. The Provisional IRA (PIRA) broke from the OIRA in 1969 over abstentionism and how to deal with the increasing violence in Northern Ireland. Although opposed to the OIRA's Marxism, it came to develop a left-wing orientation and increasing political activity. The Continuity IRA (CIRA) broke from the PIRA in 1986, because the latter ended its policy on abstentionism (thus recognising the authority of the Republic of Ireland). The Real IRA (RIRA), a 1997 breakaway from the PIRA consisting of members opposed to the Northern Ireland peace process. In April 2011, former members of the Provisional IRA announced a resumption of hostilities, and that "they had now taken on the mantle of the mainstream IRA." They further claimed "We continue to do so under the name of the Irish Republican Army. We are the IRA." and insisted that they "were entirely separate from the Real IRA, Óglaigh na hÉireann (ONH), and the Continuity IRA." They claimed responsibility for the April assassination of PSNI constable Ronan Kerr as well as responsibility for other attacks that had previously been claimed by the Real IRA and ONH. That part of the IRA that accepted the compromise of the 1921 treaty which established the Irish Free State and that became the initial Free State government. Its supporters became the modern-day Fine Gael Party, currently the largest party in the Republic of Ireland. With additional recruits, it became the National Army, later known as the Irish Defence Forces. That part of the original IRA organised within Northern Ireland not included within the Free State (see below). That part of the IRA, organised within the twenty-six counties that became the Free State, which rejected the compromise of the 1921 treaty with Britain and under Liam Lynch fought the Irish Civil War against the Free State's National Army (led by Michael Collins), with the support of the anti-treaty faction of Sinn Féin, led by Éamon de Valera. In the 1930s, the remainder of the IRA including that part of the Old IRA organised within Northern Ireland, attempted a bombing campaign in Britain, a campaign in Northern Ireland (after a change in leadership to the north) and some military activities in the Free State (later the Republic of Ireland). After a period of poor relations, the symbiotic relationship between Sinn Féin and the IRA was re-established in the late 1930s. By the 1960s, after the failed border campaign, Sinn Féin moved towards a Marxist class struggle outlook. With the outbreak of the Troubles, Sinn Féin, or as it came to be called after the formation of the Provisional IRA and Provisional Sinn Féin, Official IRA / Official Sinn Féin found itself sidelined because of its decision not to engage the British state militarily. Over time the Official IRA faded away, while Official Sinn Féin moved to a purely Marxist position, renaming itself first Sinn Féin the Workers Party, and then in 1982 the Workers' Party of Ireland. After the Official IRA's 1972 ceasefire, it and Official Sinn Féin suffered a split in 1974 leading to the formation of the far left Irish National Liberation Army (INLA) and Irish Republican Socialist Party, led by Seamus Costello (later assassinated by the Official IRA during a bloody feud). The INLA was known for a series of internal feuds and some of the more sectarian killings by Irish nationalists. In 1986, the Irish People's Liberation Organisation split from the INLA. In 1992, the Workers' Party suffered a split when a majority faction failed to secure changes. They left and formed the Democratic Left. Ultimately, the Democratic Left merged into the Labour Party. In 1969, the more traditionalist republican members split off into the Provisional IRA and Sinn Féin. The Provisional IRA operated mostly in Northern Ireland, using violence against the Royal Ulster Constabulary and the British Army, and British institutions and economic targets. They also killed members of the Irish Army and the Garda Síochána (the Republic's police force), which was against one of their standing orders. A further split occurred in 1986, when the former leader of Sinn Féin Ruairí Ó Brádaigh – who was replaced by Gerry Adams in 1983 – walked out of the Sinn Féin Ard Fheis after delegates voted to end the policy of abstentionism to Dáil Éireann. The followers of Ruairí Ó Brádaigh, who adhere to republican legitimatism, and opposing Sinn Féin's decision to abandon abstentionism, set up a rival party and military wing, called Republican Sinn Féin and the Continuity IRA. In 2006, the Irish Republican Liberation Army, Óglaigh na hÉireann and Saoirse na hÉireann split from the Continuity IRA. In 1997, Members of the Provisional IRA who did not accept the peace process split off to form the Real IRA. Its political wing is the 32 County Sovereignty Movement. In 2009, Óglaigh na hÉireann split from the Real IRA. In 2012, the Real IRA merged with other republican groups including the Republican Action Against Drugs (RAAD) to form the New IRA. In 2011, former members of the Provisional IRA according to the Belfast Telegraph, announced a resumption of hostilities, under the name "Irish Republican Army". 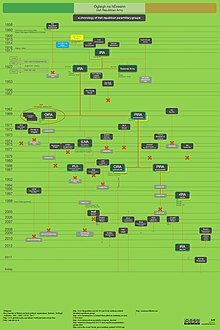 ^ For a diagrammatic version of this, see Genealogy of the Irish Republican Army. ^ "Origins of the IRA name". An Sionnach Fionn Blog. 27 September 2014. ^ "Primates' creative ambiguity averts schism". The Irish Times. 2 February 2005. ^ Suzanne Breen (22 April 2011). "Former Provos claim Kerr murder and vow more attacks". Belfast Telegraph. Retrieved 23 April 2011. ^ "Irish Republican Army (IRA) | Irish military organization". Encyclopedia Britannica. Retrieved 4 September 2017. Liebknecht, Karl, Militarism and Anti-Militarism (1907); an English translation (Cambridge 1973). Townshend, Charles, 'The Irish Republican Army and the Development of Guerrilla Warfare 1916–21', English Historical Review 94 (1971), pp. 318–345.